Well, I hope that you will take away the idea that structuring and coming up with a plan before starting to write a novel or a short story, or any kind of fictional work, will save you a tremendous amount of time later on. 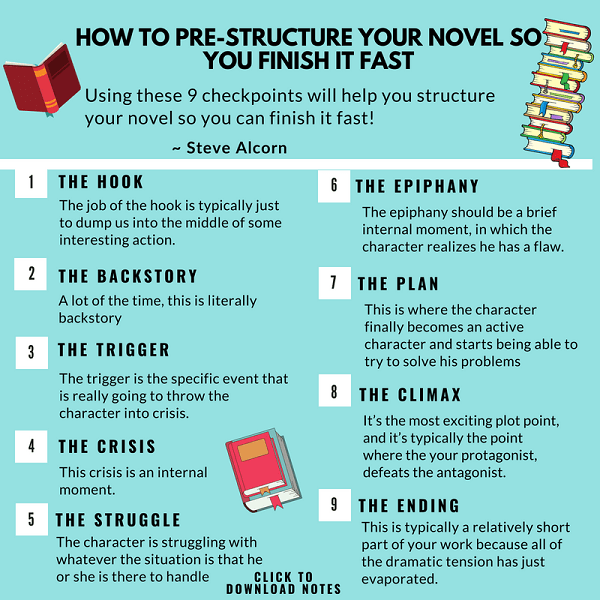 I’ll show you the specific techniques for structuring your novel so that before you even start writing, you will guarantee that you are going to finish. So, no more writer’s block, and no more getting stuck. You are going to learn the keys to having a firm structure in place for writing fiction too. Well, I think that any of us who have tried to write fiction have encountered a problem in which we get very excited about an idea, and the idea may be based upon a character, it might be based upon a setting, or it might be a plot idea about something that happens. We sit down and start furiously writing, and then we write the length of a chapter, maybe, and things start to get a little fuzzy. We aren’t quite sure where to go, and we start to get a little bit lost.